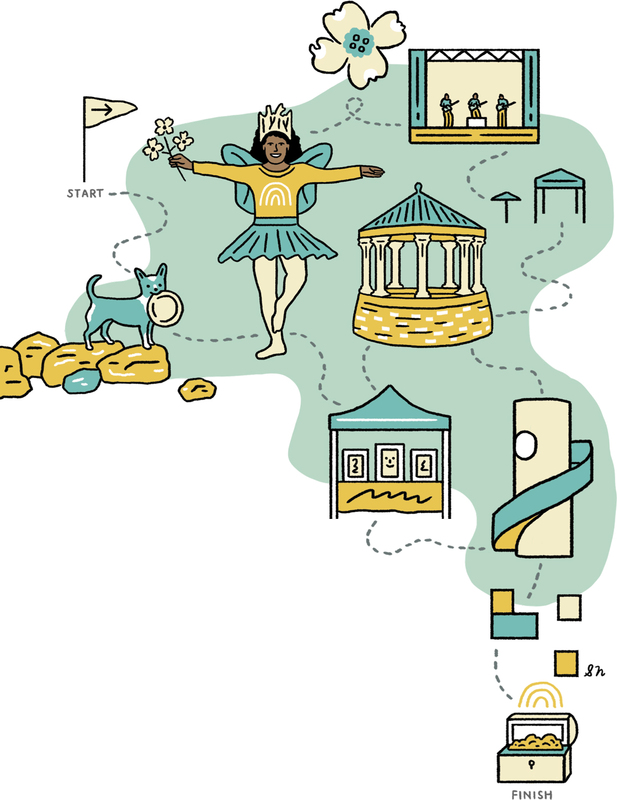 With its annual puzzle hunt, Out of Hand Theater treats the map of Atlanta like a gameboard. Since 2006, previous incarnations of the Game have required players to sample chocolate at Krog Street Market, visit Martin Luther King Jr.’s grave, collect pamphlets from religious zealots in East Atlanta, and even do the Chicken Dance in Little Five Points. “We love making clues that don’t look like clues,” says Ariel Fristoe, one of the gamemasters who send hundreds of players into Atlanta’s neighborhoods to participate in the group’s annual citywide scavenger hunt that lasts throughout the night. Over the years, Out of Hand’s inventive approach to theater has included staging plays inside automobiles and in people’s living rooms. Using the Game to spotlight neighborhoods like Castleberry Hill takes a similar guerrilla-theater approach but awards $500 in prizes. “Our mission is to bring arts to people and places that might not have it otherwise,” Fristoe says. The company brought the Game to the Atlanta Dogwood Festival in 2018, rebranding it as the Dogwood Quest. The move gave Out of Hand the chance to reconceive the production as both a game and a performance piece. Fristoe also wanted to make the game fun for festival bystanders. “How do we make it entertaining for people who don’t want to play a puzzle?” The company drew on its side gig producing interactive performances for the World of Coca-Cola to craft characters such as fortune tellers, trolls, and the Dogwood Fairy, a costumed figure on stilts who gives the players their mission. As opposed to some of the more far-ranging games of the past, the Dogwood Quest takes place entirely in Piedmont Park on April 13. Teams sign up either in advance or at the Out of Hand Booth at the Festival and have two hours to solve the clues. Though not as challenging as the Game, the Dogwood Quest still offers puzzle fans an adventure. “The Genius clues, which we usually do at the end, are almost impossibly difficult puzzles to be tackled by bona fide smarty-pants only,” Fristoe says. Or you can just go for the prizes. The Dogwood Quest. 2-4 p.m., Saturday, April 13. Start at the Main Stage in Piedmont Park. 404-462-8836.